This season I started working with Coach Kevin Coady from TriForce Triathlon Team, with a goal of significantly structuring my training. 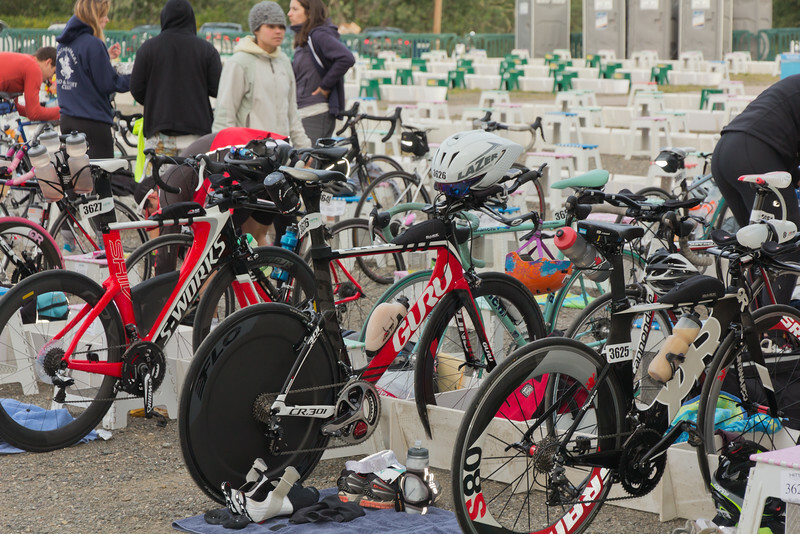 My “A” races this year are Ironman 70.3 Hawaii on May 30th and Ironman Boulder on August 2nd. Coach Coady suggested I sign up for an early season local race around April, and HITS Napa Valley Half Ironman fit the bill perfectly. I finished the race in 5:09:42, which was 3rd place in my age group (3/27) and 17th overall (17/261) in the race. I was pleasantly surprised by the results given where I am at in my training for the year and the general difficulty of the course (which, as described further below, is extremely hilly). My primary goals going into the race were to focus on (i) refining my nutrition strategy by upping the calories on the bike to see if my stomach could handle it at higher intensities and (ii) work on bike pacing using a power meter, all with a view to where I stand in my fitness coming off of a “middle base” build period before I shift into a half ironman specific build for Hawaii. I also ended up with two PR legs at the half ironman distance for me – swim and run. Special thanks to Andrew who grabbed my award at the ceremony – as Sarah and I were in a rush after and I didn’t have time to check the results. As I mentioned above, so far this year Coach Coady and I have gone through “early base” and “middle base” builds, averaging just a little north of around 10-12 hours per week of training (some lower for recovery weeks and higher for bigger base building weeks). Lot’s of early mornings! The volume will certainly increase as I shift to a half ironman specific build for Hawaii, and then over the summer an ironman specific build for Boulder. 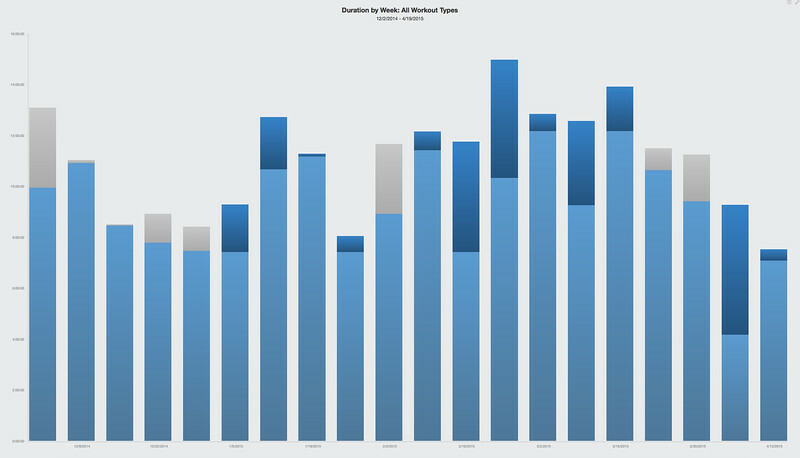 The chart below has volume since the beginning of December through yesterday. Going into the race, I was feeling good and fitness v. fatigue levels were at a reasonable level. 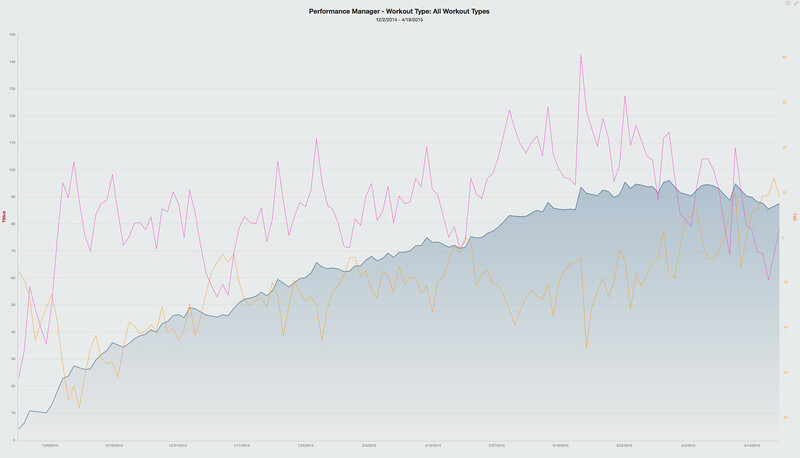 My performance management chart below generally shows where I was leading up to race day. To put this chart in perspective, the blue portion is “fitness”, which is CTL (chronic training load) encompassing the TSS (training stress score) of all workouts older than 15 days prior on a particular day of measurement. The pink line is “fatigue”, which is ATL (acute training load) encompassing the TSS of all workouts within the past 14 days of a particular day of measurement. Finally, the yellow line is “freshness”, which is TSB (training stress balance), encompassing essentially the ratio of CTL to ATL on a particular day. To cut through everything, the goal on any race day is to maximize your “fitness” (CTL) and “freshness” (TSB). Hence, a taper period before the race where your fatigue goes down quickly (ATL), your freshness goes up quickly (TSB) and there is minimal loss on your overall fitness (CTL). Starting Off Slow – Per my plan, I really kept repeating to myself during the first ~300yards to take it easy and ease in. I generally go out way too hard in races, which is exacerbated by cold water causing me to hyperventilate. 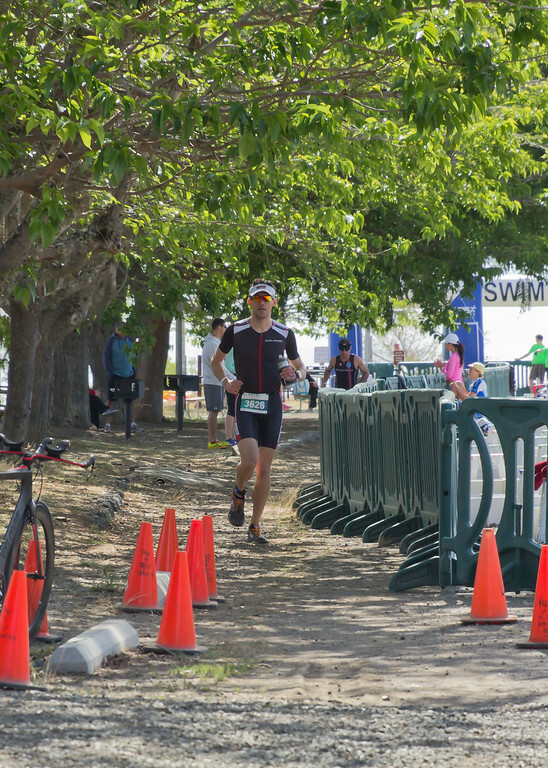 None of that during this race – I felt good and smooth and eased into my pace. 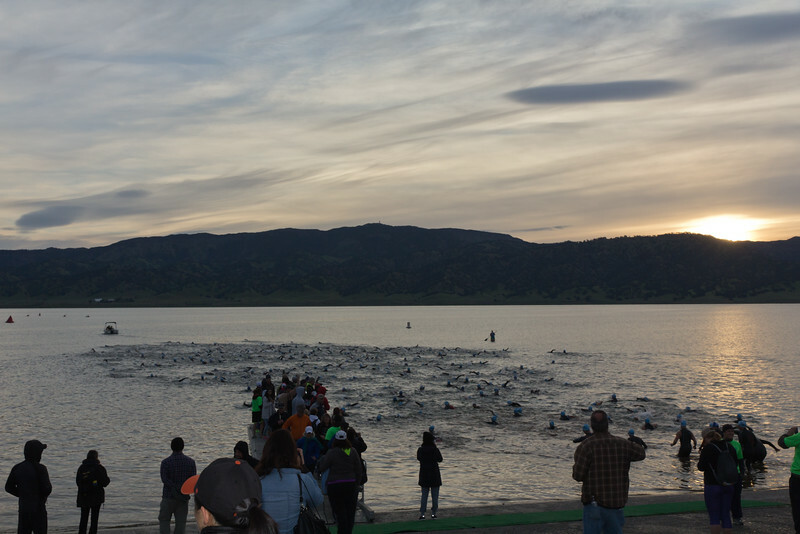 Drafting – This was the first race where I think I nailed the drafting portion of swimming. I was able to swim directly behind other swimmers feet in their wake ~90% of the time. During one block for ~50% of the race, I was on the same guy’s feet. A couple of times I would pull out next to him to see if I could swim harder myself, and I always found that while I could swim faster it would be at a noticeable increase in effort, so I would just duck back in. At other points of the race, I would draft and just jump feet to feet. What was amazing is that I felt that I was barely moving the entire swim. It is amazing how much energy you save drafting. PR! 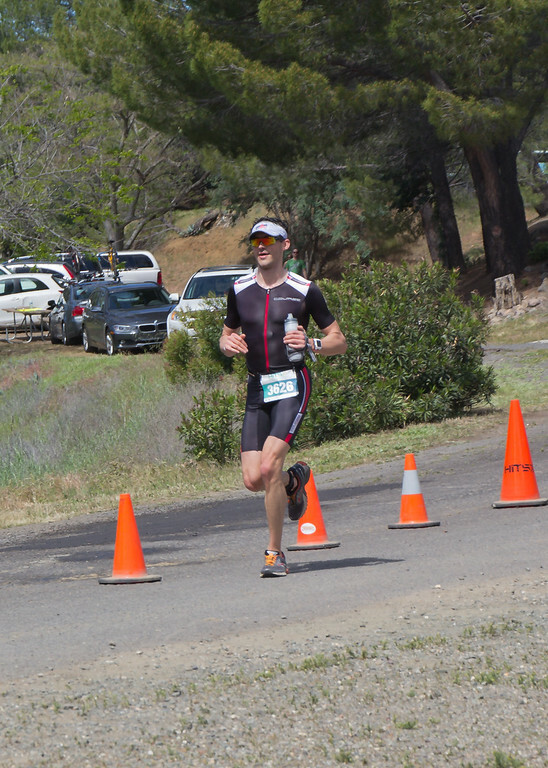 – My previous swim PR at Ironman 70.3 Vineman last summer was 34:39. So I set a new personal record on the half ironman swim leg by 1:19 during this race. That is surprising to me given how easy I thought this swim was. 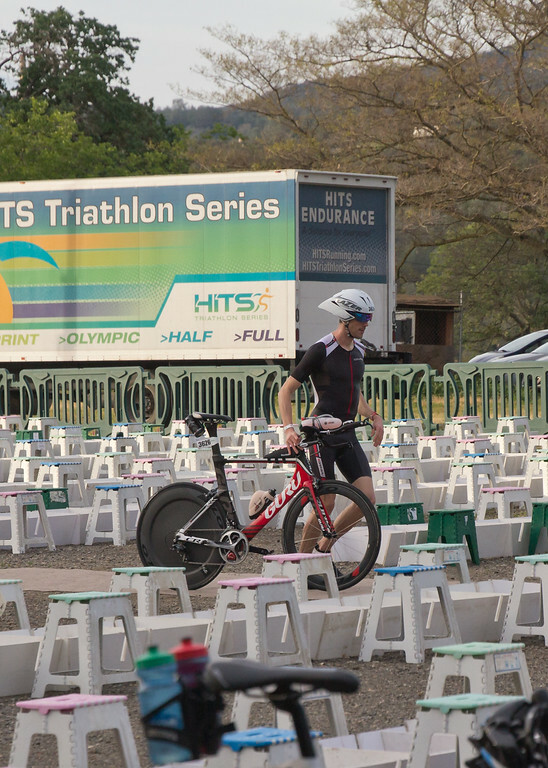 No Warm-Up – I was slow in setting up my transition, so I didn’t get down to the water early enough to get in a proper warm-up. There was also a mandatory athlete’s meeting I had to attend. I managed for about 2 minutes before the race to at least get in and put my face in the water. Fortunately, it was warmer than predicted (low 60s as opposed to mid 50s). Overall – I did a super light jog up the boat ramp, pulling my wetsuit down to waist and my goggles/cap/earplugs off/out by the time I got to T1. I was also quick to put on socks and shoes and upper portion of my LG M2, which went on easily given I had practiced this wet a couple of times (as sleeved suits can sometimes be a pain when wet). Slow to Get Wetsuit Off – When I was rolling down my wetsuit to step out of it, my timing chip got wrapped up in my right leg to the point I had to sit down to take it off. This was my first race in my Roka and it is a bit tighter at the ankles than my old wetsuit. I need to be more careful stepping out of the leg with the timing chip going forward. Preparation for Bike Temps – My strategy for cold weather on the bike ended up being a complete failure. Looking at the pre-race temperature forecast, I knew the majority of the bike would be in temps in the low 50s and before the sun really got up over the mountains. When you are wet and going downhill, that can lead to some very cold hands, feet and upper body. Therefore, I had packed arm warmers, gloves and toe warmers. Fortunately, I put the toe warmers on my shoes and socks, so no problem there. However, when I got out of the wetsuit I decided it “wasn’t cold” and didn’t want to take the time (which would have been 10 seconds!!!!) to put on arm warmers and take my gloves. I knew it was cold out and I know I get cold on bike rides, but I still decided not to take them. Big mistake on the bike! My race plan was to really try and not cook myself on the hills. So I was planning a target of around 220-225w (with a cap of 230w) on the “flats” at normal speeds, a cap of 240w for moderate hills (~12-13th mph) and a cap of 277w for big hills (i.e., <12mph). For the downhills, if I got above 25mph I was going to back off power and stay aero and if I was above 28mph I would completely coast and stay aero. I worked out that strategy with Coach Coady and the soft-pedaling and coasting at high speeds is great! You save so much energy with very little loss in sped. o Hydration: Water with one Nuun table in my bottle between my arms on the aero bars. Each Nuun tablet has the following electrolyte profile: 345mg sodium, 97mg potassium, 13mg calcium and 25mg of magnesium. My plan was to drink regularly on bike and take water hand-ups at aid stations to refill and add one Nuun tablet at each refill. I was aiming for ~ 24oz/hour. o Calories: I had a “3 hour” concentrated bottle on my down tube that I pre-mixed, and would sip off of every 15 minutes (aiming to finish 1/3rd of the bottle every hour). My mix contained 8.25 scoops of Hammer Sustained Energy (unflavored) and 1 Nuun Tablet (for very mild flavor and a bit more sodium). This mix provided 293 calories/hour, including 63g of carbs and 9g of protein per our (and a full mix of additional electrolytes). Wattage Caps – I was pretty good and sticking to my caps on all of the climbing on the bike. There were times were I would spike momentarily above my caps on certain climbs, but overall I paced pretty well. Coasting – I have never raced before where I let off power above certain speeds and completely top pedaling above certain speeds. There was a lot of that the last 25 miles of the course. It was funny to be going 30+ mph and just coasting and have some guy hammer by me, to only catch him within 10 seconds on the next hill. I am sold on this strategy, and I think it is why my normalized power for the entire bike leg is so low as well (as doing this really drives down your average watts). Coldness – I paid the price dearly on the bike from being cold! Fortunately I wore socks and had toe warmers on. However, my hands and complete upper body when numb very quickly. I was aggressively shivering on the ride until about Mile 30. I have to assume I expended quite a bit of energy with all of the shivering. Another thing was my power – during the first 30 miles I really felt I was under-powering the bike a lot. I was so focused on shivering and how cold I was and waiting for the sun to come up, that at times I would look down on the flats and I would be going 200w (my target was 220w). I think this was a double-sided coin– slow bike on flats, but likely saved my legs a lot on the hills. Fortunately, around mile 30 of the bike the sun finally started to rise over the mountains and I quickly warmed up. The forecast was for the temp to rise to the low 70s later in the day, and I was super happy to finally warm up. The last 20 miles of the bike were a bit less hilly, as most of the big climbs are in the beginning. It felt great to speed up a bit and stay warm. My second transition was fast at 1:30, which was 2nd in my AG (2/27). I was able to do a flying dismount on the bike with socks already on lead to very quick T1. I slipped on shoes, grabbed coke bottle and took off. This was a fast transition for me. Nutrition – This was the first race I tried the using Coke entirely for my run calories and hydration. I have taken Coke hand-ups late in the half marathon in past races, and it always sat well. I know a ton of racers like using Coke 100% for calories and hydration in ironman races, so I figured I would give it a shot. I had a 21oz bottle of flat Coke to start. Note, being flat is key so the stomach handles it while running. It down very easy and I was able to take a sip every 5 minutes, finishing ¼ of the bottle every 15 minutes. At around the 50 min mark (turnaround on the run), I walked that aid station to top up my bottle. Otherwise, during aid stations I would just grab water to dump on my head. 20oz/hour of Coke provided 240 calories, including 65mg of carbs (all sugar essentially) and 75mg of sodium (which is a bit low, but I took in a ton of sodium and other electrolytes on the bike). PR! – Surprisingly, this was also a PR for the half ironman distance run for me. 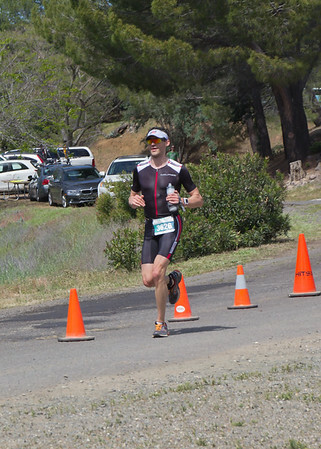 My previous PR was Ironman 70.3 Vineman last summer at 1:40:03 – so this was a nice improvement to 1:36:26 on a much harder run course than Vineman. Without the hills, I could easily have paced quicker. Garmin – My Garmin says my run was only 12.8 miles. Either the course or my Garmin is off! All in, I was very pleased with the outcome of the race and meeting all of my goals for the race. It was a beautiful, challenging course. I should have taken my measures to stay warm on the bike, but I definitely learned from that mistake. Otherwise, I was very happy about the results and getting a podium spot in my age group in light of where I generally am in training. The next month and a half will be a big build for Hawaii, followed by an even bigger build for Boulder. 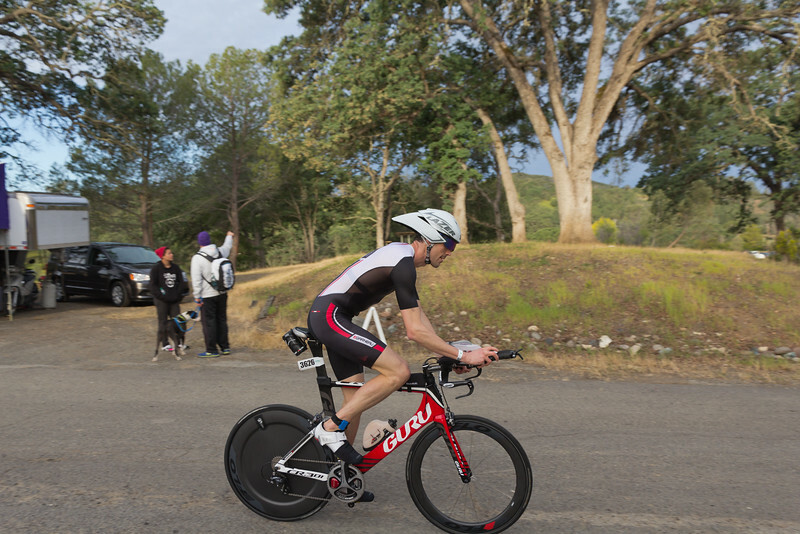 I am pumped to be working with Coach Coady at TriForce Triathlon Team. Looking forward to more very early mornings! Of course, I could not do any of this without Sarah’s amazing support! She graciously game to cheer me on throughout the day, and after we had a good time in Napa for the rest of the afternoon and evening. Sarah and I also hung around the next day to volunteer at the HITS Napa Olympic, Sprint and Open triathlons, which was a ton of fun. It was great to relax and watch everyone else race and cheer them on too! Ha! Well, there are at least X and Y descriptors, albeit very small! Grey is scheduled and not completed, lighter blue is schedule and completed and dark blue is “overages” (i.e., over scheduled).